It has been an exhausting weekend of parent duties, so all I can think of is sleep. Like I’m counting down until I can crawl into bed, turn on some totally worthless tv and just drift off into snoozeville. Doesn’t that sound lovely? 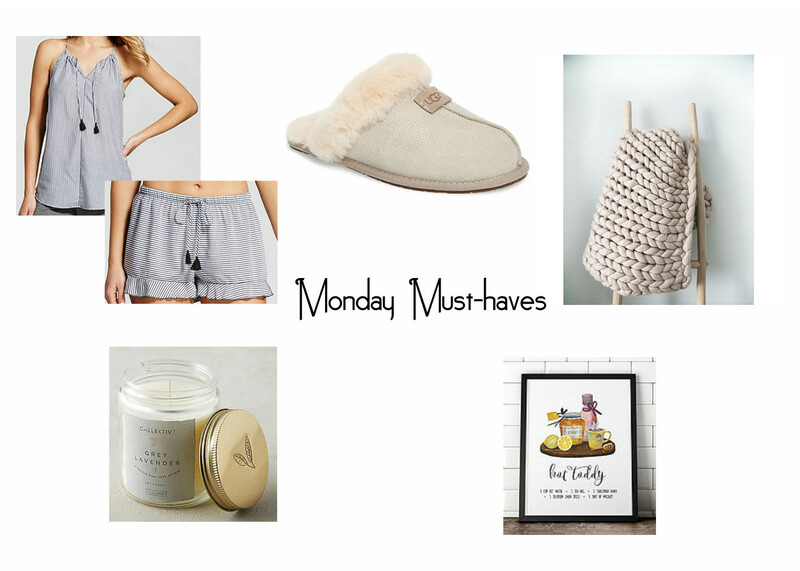 Because of this I thought this weeks must-haves would be all about me dreaming of some ZZZ’s. I have been eyeing this pajama set the last few times I’ve gone to, you guessed it, Target. There is just something about the stripes. The top is actually so cute, I’d wear it during the day, except now that I’m making you all aware that it is a pj top I maybe shouldn’t do that. The shorts have the little extra ruffle detail that I just love too. I’m in need of some new cozy slippers and I just loved the look of these Uggs. The color of them is so fun and different from the usual brown that I have always thought I’d grabbed. How about a ridiculously cozy blanket for all this worthless tv watching! This merino wool blanket by Sarah Lou Co. is a stunner. I recently saw it on an Instafriend’s feed and it stopped me in my tracks. I’m all about lighting a candle and this grey lavendar one sounds like it will be nice and soothing. And because it just sounds so very yummy to go along with getting cozy in bed…why not have a Hot Toddy? This little recipe print is so cute and a perfect addition to any bar cart area.